In the tech industry, where Latinos and African-Americans make up just five percent of the workforce at leading companies, it’s been widely established that there’s a serious diversity problem. 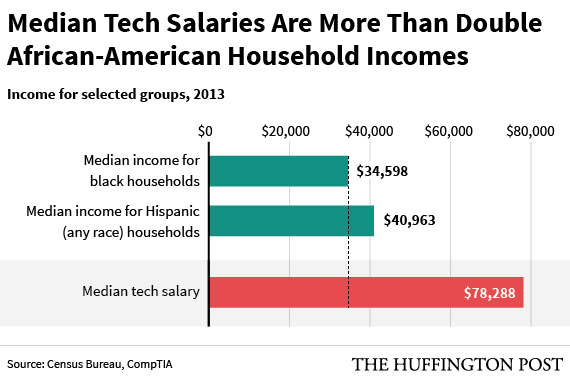 Less widely known are the glaring economic effects for minorities who are excluded from the field: The typical tech worker’s salary is more than double the median household income for African-Americans. It is almost double the median household income for Hispanics. Data from U.S. Census Bureau American Community Survey; analysis by CompTIA analysis. Infographic by Alissa Scheller. On the flip side, increasing representation of minorities in tech will have a direct payoff -- minority college students who graduate with a degree in a STEM (science, technology, engineering and math) field make more than their counterparts with humanities and education degrees, according to a 2012 University of Southern California study. Groups within and outside the industry are working to increase the number of black and Latino entrepreneurs and STEM workers in the field. CODE2040, a nonprofit that aims to boost minority representation in tech, has a summer fellowship to introduce college students to the tech industry. 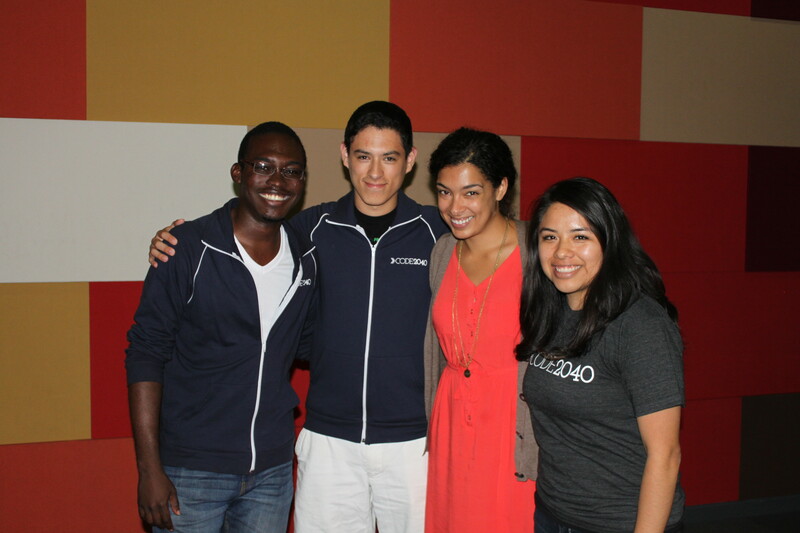 CODE2040 2013 fellows Ebenezer Sefah, Carlos Folgar, and Janeth Moran Cervantes with founder Laura Weidman Powers (third from left). Courtesy CODE2040. “Just statistically, you’re going to get a huge economic boost when students of color go down these paths,” CODE2040 co-founder and CEO Laura Weidman Powers said. She spoke to The Huffington Post while in Detroit last month to receive the Ford Freedom Scholar Award, which honors an African-American who has excelled in his or her field. “We had a handful of students a couple summers ago who were chatting with each other about their internships and realized suddenly that they were all making, as summer interns in college, more than both their parents made 30 years into their careers," Weidman Powers said. “That was a pretty sobering and exciting realization for the students. They suddenly had a totally different vision of where their lives could go and how they could impact their family and community." It quickly became apparent how few other people of color were in her new field. That lack of diversity, coupled with a growing sector that's creating jobs faster than universities are producing qualified graduates, was the impetus for CODE2040. CODE2040 has started small, selecting about 80 fellows in total for its annual program including this summer's cohort of 35. The students -- who are overwhelmingly on financial aid for their schooling -- are placed in internships at CODE2040's partner companies, including Reddit, SurveyMonkey and Etsy and receive a minimum weekly salary of $1,000. Fellows learn from mentors, attend training and seminars, gain a growing network of minority entrepreneurs and see that they have a place in the industry. “For some students... they don’t know people who have worked in tech or in Silicon Valley, and so it didn’t really feel like a possibility for them,” Weidman Powers said. “We also have some students who are really high achieving, who took a look at their options and thought, ‘Well, why would I go to the tech industry when there aren’t people like me succeeding?’"
The connections students make in CODE2040 help them build a network of minority entrepreneurs and others in the industry who are then willing to help them in their job search, Weidman Powers said. That additional support is important when a degree alone is no guarantee of employment -- according to USA Today, 11 percent of computer science and computer engineering graduates from top colleges are black or Hispanic, more than double the portion of the workforce they make up at big companies like Google, Facebook and Yahoo. 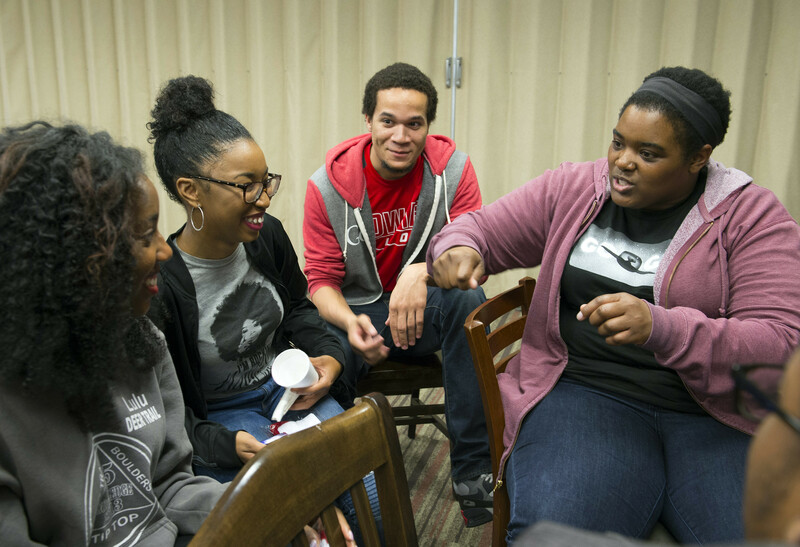 Google software engineer and Google In Residence Sabrina Williams, right, talks with students during a Google Student Development class on Impostor Syndrome at Howard University in Washington, Tuesday, April 14, 2015. AP Photo/Molly Riley. But balancing the numbers requires changes long before students get to college. The Leveling the Playing Field Institute, which aims to break down barriers to minority access to STEM professions, sees the disparity of access to STEM education for younger students as one of the largest issues. A May LPFI report on California’s public high schools found that schools with larger black and Latino populations are significantly less likely to offer any computer science classes than schools where less than half of the students are minorities. LPFI founder Freada Kapor Klein was honored alongside Weidman Powers at the Ford Freedom Awards, receiving the Legacy Award with her husband Mitch Kapor. Before the ceremony, the two women spoke to 1,700 local elementary and middle school students about the importance of STEM education. "If we believe that genius is evenly distributed throughout the population, we’ve got to ask why some groups are so grossly overrepresented in tech,” Kapor Klein told HuffPost in an email. “The answer is that there are huge disparities in opportunity for young people depending on the zip code they were born in, and there is a moral argument to be made for leveling the playing field." 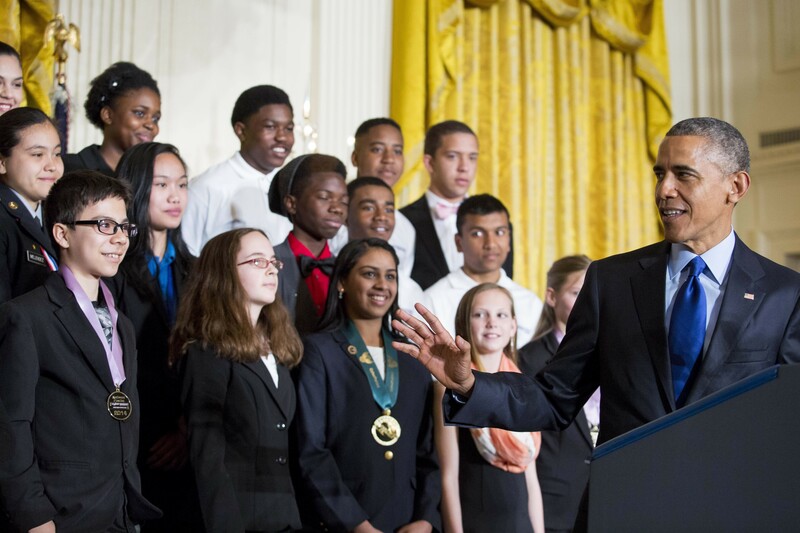 With students from a range of STEM competitions from across the country looking on, President Barack Obama announced more than $240 million in pledges to boost the study of STEM fields at the White House, March 23, 2015 in Washington, DC. Since some companies released their workforce demographics last year, there’s been more recognition of the lack of diversity in tech and a stronger commitment to changing it, Weidman Powers said. Hiring more minority employees isn't just a "moral" issue but could also help companies' bottom lines: in studies, workplace diversity has been linked to increased creativity, innovation and profits. “Entrepreneurs tend to scratch their own itch -- they come up with solutions to problems they’ve seen and experienced," Kapor Klein said. "When certain groups of people, with specific lived experiences, are not at the table, tech is missing out on thousands of potentially profitable ideas." 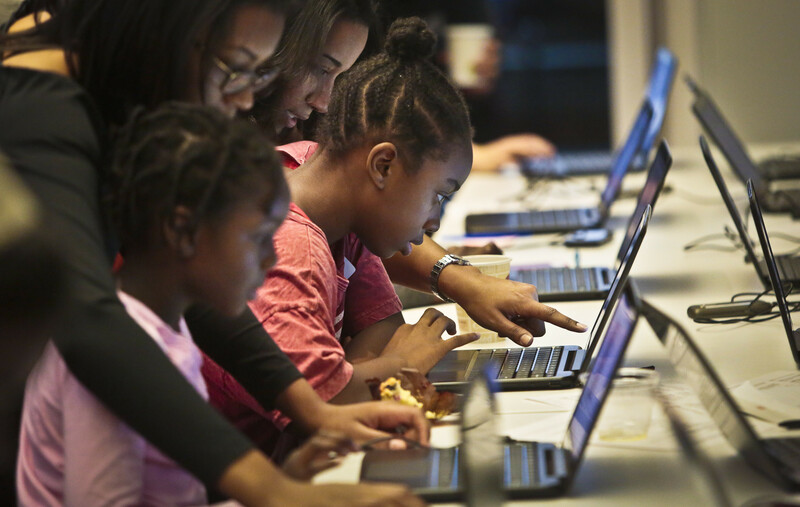 Black Girls Code workshop volunteers guide students during an app building session at Google, on Saturday, Dec. 14, 2013 in New York. AP Photo/Bebeto Matthews. <strong>10. Connecticut</strong> <strong>>> Supplemental poverty rate 2011-2013:</strong> 12.5% (17th lowest) <strong>>> Official poverty rate:</strong> 10.7% (7th lowest) <strong>>> State price level: </strong>6th highest <strong>>> Pct. without health insurance:</strong> 9.4% (8th lowest) Based on pre-tax income alone, 10.7% of Connecticut residents lived in poverty between 2011 and 2013, one of the lower rates nationwide. Based on the supplemental poverty measure, however, 12.5% of state residents lived in poverty, still among the lower rates, but the 10th largest deviation from a state’s official poverty rate in the country. The supplemental poverty rate tends to be higher among older Americans. With the help of the nation’s third highest average social security payment, however, retirement-aged Connecticut residents had incomes of $26,581 on average, more than in all but a handful of states. The average earned income tax credit was $2,140 in Connecticut last year, one of the lower rates.